This is a unique review and it will make sense when all is said. This set is very beautiful and has a happy bright pattern. I saw this and had to have it! The quality is outstanding and I am sure you won’t be disappointed. I am sure this set will last years through many washings in a front loader. It will brighten the most boring room immediately. Unfortunately my set had a fluke issue and I returned it today. Overstock was great in resolving this issue so shop with confidence. I recommend this set. 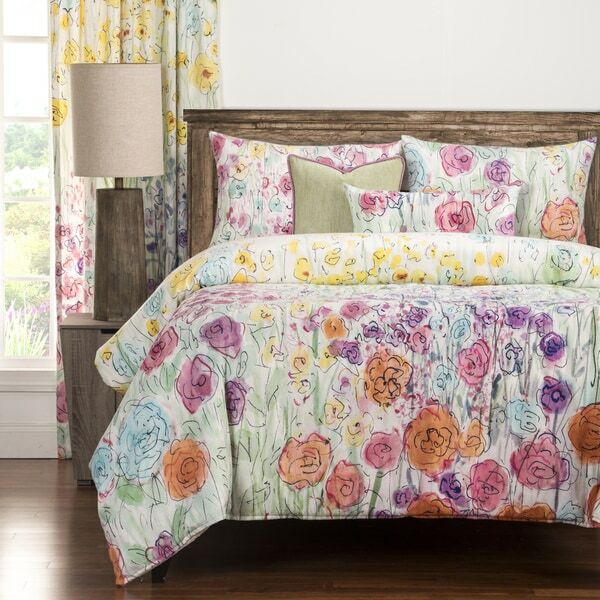 Lend a bright, whimsical, and romantic touch to your sleep space with this bedclothes set. The pieces are covered in a lovely floral print, digitally printed to look as though each flower has been hand-sketched in water colors right onto the material. The ultra soft feel and cozy, eco-friendly down alternative comforter fill make this set as comfortable as it is attractive. Worth every penny. GORGEOUS, Soft, washes and dries easily. Duvet cover zips AND buttons. 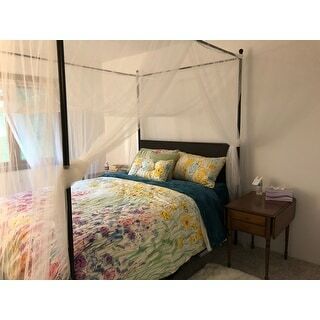 The comforter inside duvet is nice and light but poofy enough - living in Florida it is perfect. From the picture I was concerned it had a lot of blue,teal, but actually it is very yellow and green and pink predominant which are my bedroom colors. The pillows that come with it are also adorable. It is a winner!!!!! Love this set. Comes with all the pieces. The duvet insert comes with the set, so don't do as I did and order an insert. Colors are rich. Pattern is truly whimsical. Quality is topnotch. Easy to get the pillows into the shams. Bonus of two accent pillows to complete the ensemble. Soft, feminine, romantic, machine washable! Beautiful! Soft, feminine, romantic, happy, high quality, very pleased. Zippered and Machine washable comforter and pillow covers! Just what I needed ! well priced for what you get. Wow. So soft, so beautiful. I wish there was a bit more color on the pillow shams but the rectangular throw pillow is beautiful and the other one is pretty nice too. Just absolutely beautiful. It's so comfortable to sleep under. Makes it hard to get out of bed in the morning... You have been warned! Beautiful! It also unzips for washing. Not super impressed with accent pillow. The fabric piece chooses for the patterned pillow is not very colorful. Otherwise excellent purchase. After a year of gray and blue, I've decided to go with something flowery and whimsical. 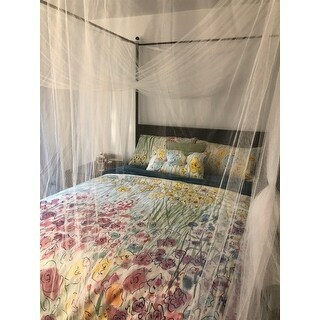 I just received the set last night so I haven't put it all together yet but it is lovely to look at and the pillow shams are so soft. 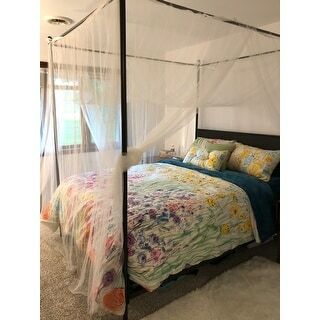 It is beautiful and will add a great bit of color to our bedroom. Love the floral print. Be prepared for shams to not match due to material print. The material is extra soft. It brightens up my entire room! This is a beautiful, well-made, high quality duvet set. The colors are vibrant and really brighten up a bedroom. I would definitely recommend to the item to a friend. Bought for my granddaughter about 3 years ago who plays on it all the time. Still looks great... really cute for her. Looks better in person. excellent quality, all as expected. First one received appeared to have been repacked, as bedding, this was unacceptable. Overstock quickly rectified by immediately sending out a new one & a free return label for first one. Also gave a $15 credit to my account. Very pleased with their service. I love this! It is even more beautiful in person. Very happy with the set. It looks great. The pattern is colorful, bright, cheerful and whimsical. I really liked it; however, the pattern and color fought with the numerous pieces of wall art in my bedroom! I didn't expect that! "Are the drapes in the background that match available??" At this time we do not offer the curtains on our website. "Love the look of this set, but was looking for 100% cotton. How does the microfiber "feel"? Silky or polyester-ish scratchy, etc.? Does it make you hotter, etc., sweaty, during the night?" silky, it's beautiful, nicer then expected, very happy with purchase!!! "Exactly what are the 6 pieces? I am confused by the description which states duvet cover AND comforter?"